For Holiday, Guerlain released two limited edition Rouge Automatiques, Flirt d'un Jour and Nuit d'Amour. I realized we have not discussed these one-hand-application wonders on Messy Wands, and I duly apologize. I am quite a fan of these lipsticks. It's not the classiest-looking one around - the packaging pales in comparison to the luxurious Rouge G - but it's lightweight and functional. 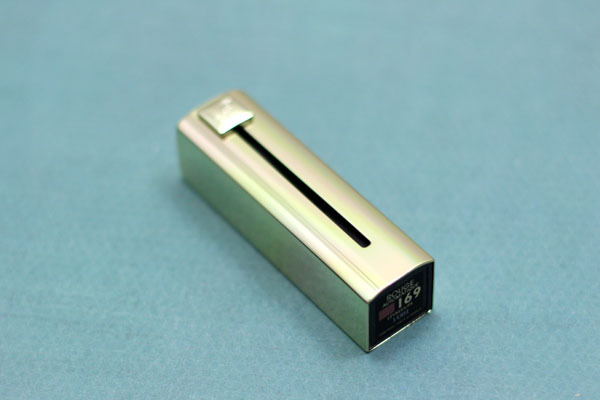 The sliding mechanism becomes extremely handy on days where it takes everything just to balance a bag and books and cup of tea in your hands. Flirt d'un Jour #169 is an unassuming soft pink, which isn't a bad thing per se. I think plenty will find this to be a My Lips But Better or What I Wish My Lips Were shade. While the Rouge Automatique formula isn't typically sheer, I did find Flirt d'un Jour to be on the sheerer side compared to the others I own. Edit: 2-3 layers of this will make it opaque. Since my lips are very pigmented by nature, Flirt d'un Jour functions more as a complement than a cover (I urge you to check out Sabrina of The Beauty Look Book's feature as comparison). 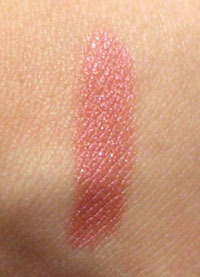 The slight shimmer you see in the swatch translates to a luminescence that creates a softening effect on my lips. 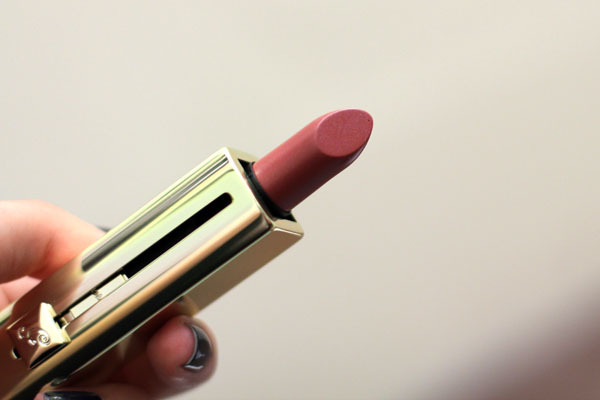 Guerlain's other Rouge Automatique offering is much more synonymous to Fall, but truth be told, I was a tiny bit disappointed by Nuit d'Amour #170. What appears as a deep, intense plum on the actual lipstick swatches to a (comparatively) mild berry hue. While it's not unattractive by any means, I was hoping for a shocker shade, and can't help but feel a little let down. That said, I think plenty of women would much prefer the toned down result. Both Flirt d'un Jour and Nuit d'Amour have a balm-like texture that makes them comfortable to wear. I wouldn't say they are very moisturizing, but they're certainly not drying either. I find that Flirt d'un Jour lasts around 3-4 hours on my lips, while Nuit d'Amore hangs around a little longer. Both are nice shades to own, but not must-haves. Guerlain Rouge Automatique Flirt d'un Jour and Nuit d'Amour retail for $35 and should be available at Guerlain counters in most major departmental stores. Nuit d'Amour looks great on you! sorry you were disappointed. 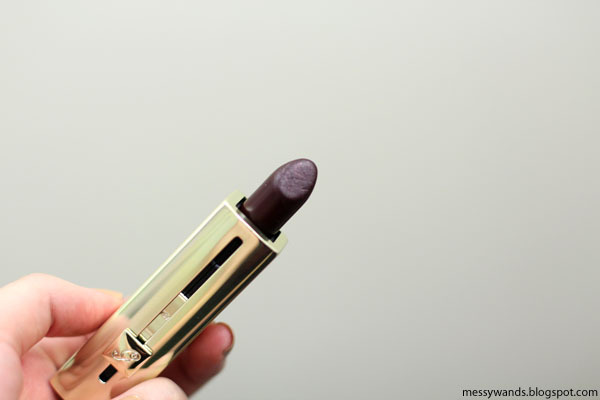 Both shades are gorgeous - if you really want a dark, gothic shade, check out Tom Ford! Update: I went to the Neimans DC today to pick up the Nuit d'Amour, and it had sold out already! Looks like it's a popular shade. I was able to swatch it on my own lips, and it's gorgeous. I must hunt this one down. I swatched Flirt d'un Jour on my hand, and to my eye it looked like it had some peach/apricot tones, which put me off buying it. Would you agree? @Leigh haha! well Nuit d'Amour is a fabulous color on its own. I just wish it were as dark as it came in the tube :P I'm so sorry you didn't manage to get it, perhaps online? I don't know about the peach/apricot. It just looks like a warm pink to me. Did you try it on your lips? Xiao, I already have Nuit d'Amour in my shopping bag on AHAlife.com, and I'm delaying only because I'm trying to decide whether to also include the Meteorites. I hear that it's beautiful, but that the Chanel highlighter (the one with the tapestry design) is even more amazing. Do you have the latter as well? Would love to know your opinion on the two. I love the plummy shade. It might not have been the shocking dark vampy lip you were hoping for, but I still think it's absolutely GORGEOUS. the shades are so pretty hehe..